WAIST HIGH: Songs From The Edge Of The World. Songs From The Edge Of The World. For sale through print on demand publishers lulu.com, Songs From the Edge of the World is an in depth, chronological look at every song that Siouxsie and the Banshees released or performed, as recorded by the press and the band themselves. The book includes artwork, photographs, release dates, chart positions, and reviews. Says author Peter Routley: "Having dismissed the idea of a full-on biography I instead decided to focus on the reason that Siouxsie & The Banshees first caught my attention some 26 years ago, the songs. 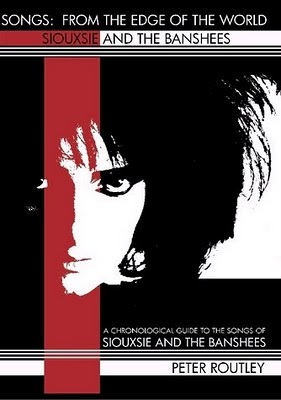 "This is a great compendium of Siouxsie And The Banshees' career. The astounding collection within was collected with a great deal of passion and integrity, and streamlined for quick reference. The thoughts of the band members themselves on all of their songs, rarities included, is of great interest; not to be overlooked are the sweet boxes of trivia added in, tour listings and press reviews, discography, film credits, a listing of the many bands that have covered Siouxsie And The Banshees songs, and many great photos throughout their career."